You are currently browsing the tag archive for the ‘the Causeway’ tag. If you’re a regular OINKtales visitor, you may have wondered about my husband (how he can stand me, whether he’s a figment of my imagination, etc.). I can tell you that he is a saint (to put up with me) and also, that he is the luckiest man in the world (because he’s with me). But you’d get a better sense of who he is if you read some of his own words. This is the first guest post to appear on OINKtales and so it is only appropriate for it to be authored by the OINKDaddy. I hope you enjoy it – you’ll let me know, won’t you? After checking out of the motel, we traced our way back into Gloucester, Mass. (made famous by The Perfect Storm) for a late lunch. We were there the day before, to take in the sights with my parents and my brother and his family. Liam scanned the names of the fisher-folk lost at sea and spotted the name Andrew Kinney. He wondered out loud if it might be a long ago descendant who disappeared in the mist off the North Shore, was gobbled up by Kraken or pulled under the waves by a platoon of angry mermen. 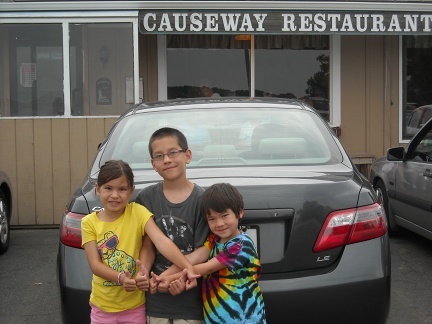 We were headed to The Causeway, a restaurant I had spotted on my iPhone (49 positive reviews! ), in a continuation of my quest for steamed clams. The narrow building – less than a hay barn, more than a shed – was barely stapled against the side of a liquor store (or as they are known in those parts, a “package store”). The whitewash was peeling. The corrugated roof, streaked black and orange, sagged in the middle, frowning at any and all who passed by. The first sign of don’t-judge-a-book-by-its-cover was that the only place to park was in back, next to a dumpster and a puddle of a fetid water. The second sign was a line of 10 people waiting in front of the establishment. There was no room inside for wait-listers, so we sat on a bench like people waiting for a bus, and, like them, tried not to meet anyone’s eye. The final sign that we had hit the jackpot was the din that escaped in burps as the door cracked open and the names from the waiting list were called. “It’s almost two o’clock,” I said to Mary. She raised her eyebrows at me; this had better be good. When we were called in, Mary and I herded Liam, Nora and Henry to a narrow table against the far wall. The pine paneling held frames of old newspaper articles, faded awards and random bits of fishing trivia. A window air conditioner groaned and whined; I half-expected it to cough. The place was B.Y.O.B., so I cracked open the two bottles of Frosty Knuckle Ale that I had brought along with us. I anxiously scanned the menu, looking for the treasure for which I had come. Swordfish tips, hamburger, halibut, mac ‘n cheese, tilapia, chicken fingers…fried clams. My shoulders drooped and I took a swig of beer. Inexplicably, I had been unable to secure an order of fresh steamers during our vacation. How could that be? I was in Seafood Central, but somehow, the only plate of clams that I could find tasted like the bottom of a Frialator. 1. Pull out the clam, strip off the brown sheath covering the neck. 2. Swirl the fat belly in a hot mug of clam juice from the kettle. 3. Dip three times in the clear dish of butter. 4. One tap of the salt shaker. 5. Pop the whole thing in your mouth. I’m not sure if it was the taste that I enjoyed most or if it was the ritual, the camaraderie, the chance to bond with the men of my tribe, or the novelty of eating something that, until recently, crawled along the bottom of the green ocean. Our waitress bounced out of the kitchen and ping-ponged around the dining room, pausing slightly at each table to take an order, a request, a question or a complaint. She had a deep tan and a fresh perm – the combination of which made her look cartoonish. I guessed her to be in her early fifties. Beads of sweat formed in a line across her forehead. Her calves were thick and muscular. I’m pretty sure she could have taken me. Again, Mary and I exchanged raised eyebrows. “Great,” she muttered, and echoed the same after impatiently waiting for each member of our family to place an order. “Waters, hon?” she asked Mary, not waiting for a reply. Soon, our waitress tangoed her way back to our table, five red-tinted plastic glasses pressed against her bosom. She used her fingers like a lobster claw to distribute the drinks. “Food’s up in a minute,” she proclaimed before barreling away. “Lemons?” Mary beckoned hopefully after her. The food arrived in under a minute: a heaping bowl of black mussels were plopped in the center of our table. A rich garlic butter sauce was delivered and placed too close to Henry, who by now was on his knees, his eyes wide at the gigantic and mysterious feast before him. “Ho-wee cow!” he exclaimed. 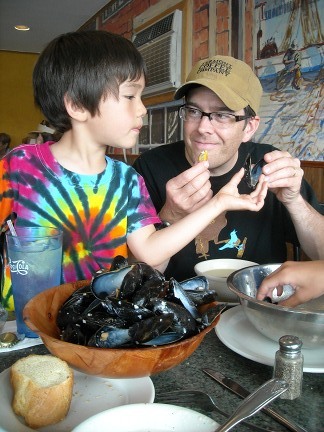 Before I knew it, all three kids were tearing the mutant mussels apart. The meat was enormous. After elbowing my way in, I found they were truly delicious; not quite steamed clams, but a satisfactory runner-up. Mary sat back and observed the spectacle with a bemused look on her face. I peered out the window over her shoulder. A rusted pickup truck had pulled over, slatted boxes stacked in the bed and water dripping off the tailgate. Two prep cooks, cigarettes hanging off the sides of their mouths, fetched the catch and ran back in through the side entrance. At the end of our gorge-fest, I was struck by two impossibilities. 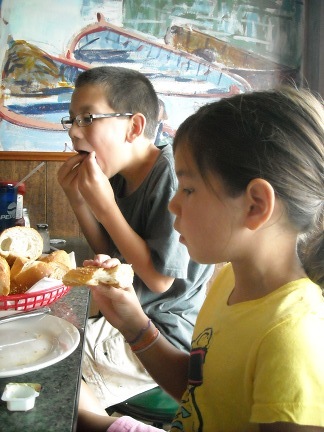 First, the bill was only $50 and second, the kids had downed most of their meals on top of the mussels. I went to the register to settle up. Our waitress wiped her brow with a bar rag while tallying another bill on a calculator that was decorated with a festive swoop and the words, “The Cape is Great!” I chomped on a complimentary toothpick. Suddenly, a woman with wispy blonde hair sidled up beside me. She wore those bug-eyed sunglasses that are in fashion and was sporting a red halter dress. “Ah, excuse me,” she said, peeking out around my shoulder. If you’re visiting Gloucester, definitely visit The Causeway for the flavor – it’s the perfect combination of fresh and local.